Haloarchaea are halophiles. They need a high salt concentrations to grow. They are a distinct evolutionary branch of the Archaea, and are extremophiles. 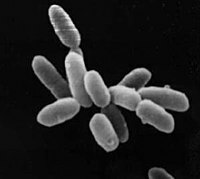 ↑ See the National Center for Biotechnology Information webpage on Halobacteria. Data extracted from the "NCBI taxonomy resources". NCBI. Retrieved 2007-03-19. This page was last changed on 25 September 2018, at 13:23.